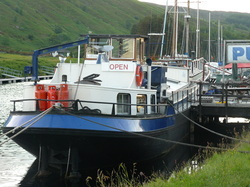 A converted Dutch barge, the Eagle is a restaurant and pub that floats in the Caledonian Canal. With a variety of food available, along with a selection of ales and a large variety of Whiskies, the Eagle caters to many different people. Situated on the Great Glen Way, it is perfect for walkers, cyclers and boaters alike. Why not come in and see for yourself? Please be aware we are cash only! It's that time of year again when we are preparing to open up the barge again for the season. This year the barge will be open 7 days a week from April until October (except from a couple of training weeks at the very beginning). We will have our first open day on Saturday 6th April! We look forward to another season and meeting all of you on your way past. Don't forget to pop in for some drinks and maybe stop long enough for some food.